A 28% national “correction” from peak to trough. 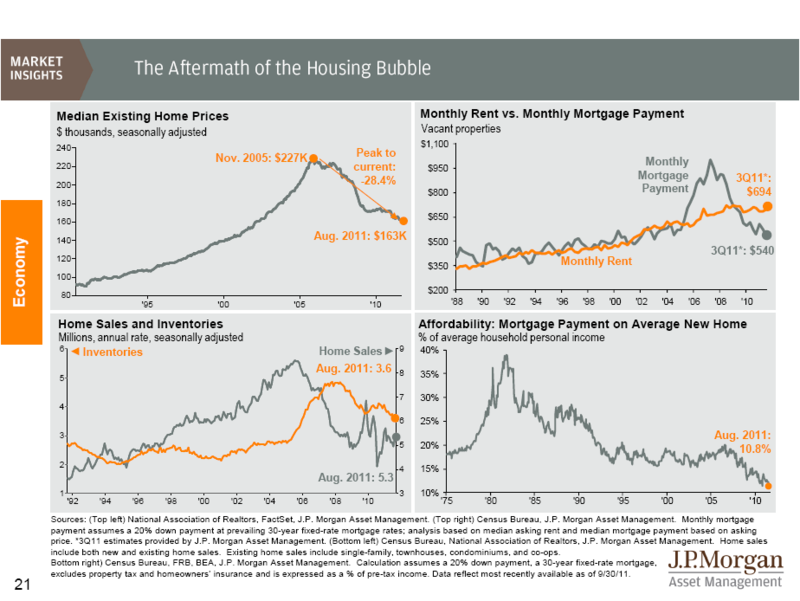 Implied 56% total housing appreciation through the 90’s – or 4.5% per year. Implied 25% total housing appreciation through the 00’s – or 2.2% per year. Index growth from 1990 through 12/2011 is 90 --> 160 = 78% total housing appreciation – an annual return of 2.7% per year – the long term average. 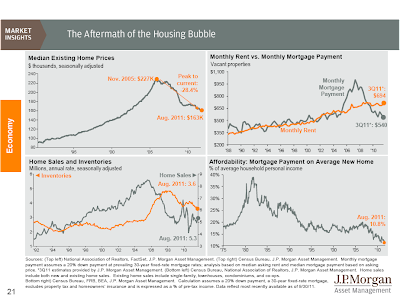 This exemplified the hyperbolic appreciation that took place from the late 90’s through 2007; do not anchor yourself to the high-point (as is human nature), but to the fact that despite the volatility, there was housing appreciation in the past two decades in accordance with long-term averages. Matter of hedonics, preference changes, subjective interpretation. The San Francisco rental market has skyrocketed as of late, which is a historically sound indicator that property values will follow and also increase materially as home ownership proves more financially fruitful in the long-term. Notice that inventories are a lagging indicator—why a secular trend must be established before developers / contractors see pickup in activity. High correlation between housing sales (turnover) with prices in the above-left graph. The bouncing sales line came as a result of federal intervention—first time home buyer credits, quantitative easing & operating twist in an effort to lower mortgage rates—which is still met with resistance of the capital markets naturally “correcting” prices further. This graph needs to be considered in context of wages, demographic shifts in age and location, and so forth. This is an example of a catch-22 statistic. Short sales - REOs (Real Estate Owned) - Foreclosures: all speak to distressed sales and what home sellers may be facing today. The silver lining within the various stages of distressed property sales is the opportunity to walk out from being “under water” and regain positive financial footing. An opportunity exists for both buyers and investors, as they are able to purchase property at a discounted price and reap the benefits of higher yield potential or sentimental bang-for-the-buck! - Title insurance, which indemnifies a Buyer against any pre-existing liens or encumbrances attached to the property, usually always comes with the purchase of a home. When buying at the courthouse steps, however, title insurance is not made available to the Buyer and you assume the risks of inheriting any defects in Title; such as, mortgage liens, mechanics liens and encumbrances. Though the aforementioned Cons may be disenchanting, purchasing a distressed property is still worth considering on a property-by-property basis. At the end of the day, purchasing a home boils down to the emotional tie you may have to it, long-term goals, affordability and value proposition.